"It was the best of times, it was the worst of times…" The year is 1775, a time that the narrator describes through a set of contradictions: wisdom and foolishness, belief and disbelief, optimism and doubt, light and darkness, hope and despair. The narrator compares this historical era to his own present moment in Victorian England. The contradictions listed in the opening of the novel portray 1775 as an age of profound transition, full of promise and threat. The comparison to Dickens's Victorian times establishes the novel's use of the past to comment on the present. In France, the government spends wildly and hands out harsh sentences to anyone connected with a crime, no matter how minor. In England, burglars infest the cities—even the Mayor of London gets robbed—and not even frequent hangings can stop the wave of crime. The narrator extends the potential similarities between revolutionary France and England. Because of their injustices, both governments are sowing the seeds of discontent and political radicalism. The narrator tells an allegory of the Woodman and the Farmer—figures of the coming revolution who are silently at work. But the royalty in both England and France believe in their divine right to rule and don't notice the gathering storm. The Woodman stands for Death and the Farmer for Fate. Both, the narrator implies, will harvest the awful products of the monarchy's political mistakes. Fyfe, Paul. "A Tale of Two Cities Book 1, Chapter 1." LitCharts. LitCharts LLC, 22 Jul 2013. Web. 11 Jan 2019. Fyfe, Paul. "A Tale of Two Cities Book 1, Chapter 1." LitCharts LLC, July 22, 2013. 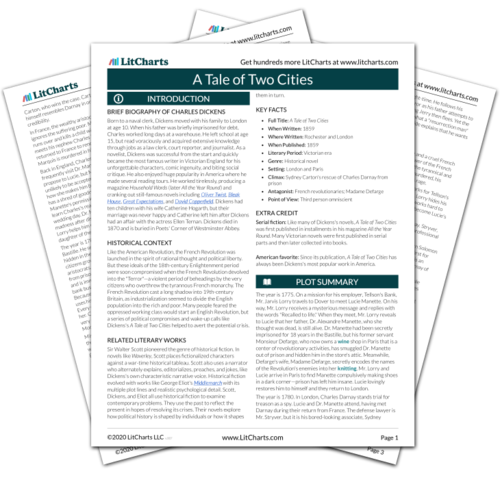 Retrieved January 11, 2019. https://www.litcharts.com/lit/a-tale-of-two-cities/book-1-chapter-1.